Spring is here, and in support of life energy rising I have created 4 BodyTalk bundles. Each bundle contains 3 vouchers, costs £100 (15% saving) and goes to the lucky person who asks for it first. Vouchers are valid for 6 months. Contact Katharina via our contact page. 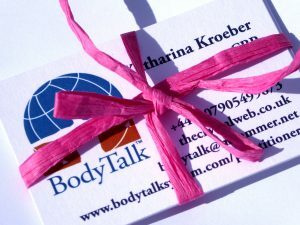 ‹ Begin the Year with BodyTalk!